Let’s be honest: as much as we take pride in stocking our closets with the most fashionable finds, we need accessories just as chic for traveling, too. Sure, our travel bags are made to carry our essentials from point A to point B, but who says you can’t make a stylish statement at the same time? While it’s very easy to tote along our trusty carry-on luggage with its matching set, these days we’re looking for something that showcases our style and keeps Us organized while on the go. Thanks to Hudson+Bleecker’s Holiday Sale, we can upgrade our carryall collection with styles that reflect our impeccable taste without leaving a major dent in our wallet! The innovative brand has granted Us readers with a 25 percent sitewide sale using the code USMUST. Plus, there’s also free shipping which makes this deal feel like a celebration for our wallets. Shopping has never been sweeter! From passport wallets, toiletry bags, jewelry cases and more, the sky is the limit for upgrading our collection with stylish offerings! Multi-functional and well-crafted, this line will certainly give our go-to luggage a run for its money. The brainchild of Eram Siddiqui, Hudson+Bleecker is all about making travel an extension of our personal lives— so you know we’re game! The designer was determined to create pieces that are durable, versatile and stylish to complement all style tastes and we can say that she knocked this collection out of the park! Testing the waters with a single travel shoe bag, Siddiqui quickly expanded with toiletry bags, cosmetic bags, hanging garment bags and more to compliment the jet-setting fashionista. Offering a stunning mix of patterned textiles, faux leather, linen and more, Hudson+Bleecker bridges the gap between practicality and up-to-date styles that we know and love. A nice change of pace from the traditional offerings on the market, this brand delivers top-quality creations that will certainly go the distance with our adventures. Designed with the mantra, “Travel Well, Travel Better” in mind, these designs will definitely rise to the occasion and give our travel gear the stylish boost it needs. Plus, Hudson+Bleecker accessories make great gifts for anyone bitten by the travel bug. Ready to give your accessories a stylish update? Check out some of our favorite Hudson+Bleecker accessories that will be coming along on our next voyage. Be sure to use the code, USMUST, to receive 25 percent of all purchases at hudsonandbleecker.com. 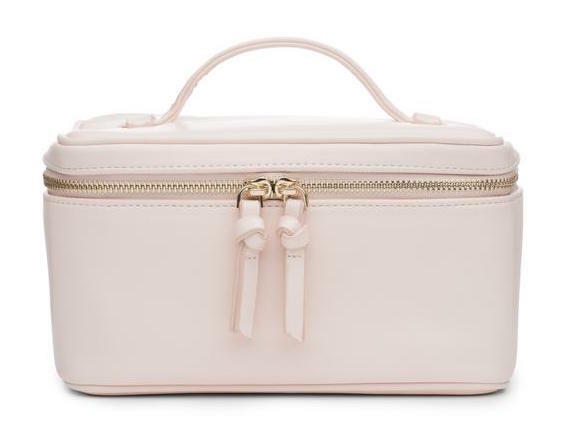 If you’re anything like Us, having a devoted beauty case is a top priority. The perfect way to keep our products secure and protect our essentials from being damaged, every fashionista should have a coveted carryall on hand. So naturally, once we set our sights on the Grotta Jetsetter Train Case, we immediately added this piece to our shopping carts. Made with soft vegan leather, this case is every bit as luxurious as we’d imagine. There’s a four-piece makeup brush enclosure that holds all of our tools in place while maintaining its shape plus elastic bands to store our lipsticks, mascara and other liquid products for an organized setup. Complete with a roomy interior, we can also store all of our palettes, powders and foundations for a seamless carry. Our favorite detail? It’s “Hello Gorgeous” embroidery. A nice playful touch that complements the light gold hardware and blush pink hue, this case exudes an elegant finish. See It: Grab the Grotta Jetsetter Train Case at Hudson+Bleecker for 25 percent off the original price of $60, now $45 to add to your closet. Tired of reaching your destination with wrinkled clothing? We feel your pain! That’s why we are elated to add the Hematite Bon Voyage Garment Bag to our vault! Crafted with modern luxury in mind, this bag will have Us feeling like the true queen we are with every carry. Flaunting a smoky sheen finish made of woven faux leather, this garment bag adds a level of mystique that pays homage to classic styling and modern functionality. We also dig the sleek detailing! Equipped with light gold hardware and zippered closure with tassel pull, this piece is unlike anything we’ve ever seen. Complete with an 8-inch drop handle, we can carry this bag over the shoulders or opt for a cross-body wear thanks to its adjustable strap. See It: Grab the Hematite Bon Voyage Garment Bag at Hudson+Bleecker for an additional 25 percent off the sale price of $116, now $87 while it’s still in stock. As much as we love to pack our essentials in sizeable bags, some things call for a compact, yet functional carryall. 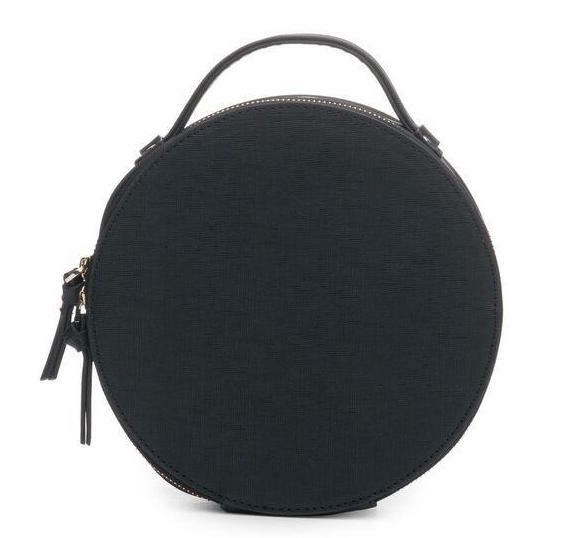 So, once we spied the Preto Nomad Round Travel Case, the choice was pretty simple. Designed with a luxe vegan Saffiano leather and light gold metal hardware, this design is the svelte find our travel collection needs. Made with a hard exterior case and top handle construction, this carryall will stand the test of time. Our favorite detail? The interior removable clear bag. Our goal while traveling is to always get in and out of the airport with ease and this bag makes the process as simple as can be. There is also a metal zip closure with a knot pull that adds chic detailing. Doubling as a handbag, this 2-in-1 offering can easily go from the airport to running errands with ease. The possibilities are truly endless for a stylish look with this case and we may even consider using it as a handbag! See It: Grab the Preto Nomad Round Travel Case at Hudson+Bleecker for 25 percent off the original price of $50, now $38 to add to your closet.